This article is about the Hindu god of creation. For other uses, see Brahma (disambiguation). For the cattle breed, see Brahman cattle. For the genderless metaphysical concept of Ultimate Reality in Hindu philosophy, see Brahman. 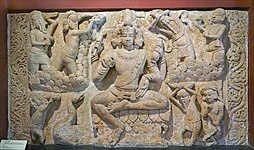 Brahma (Sanskrit: ब्रह्मा, IAST: Brahmā) is the creator god in Hinduism. He is also known as Svayambhu (self-born) or the creative aspect of Vishnu, Vāgīśa (Lord of Speech), and the creator of the four Vedas, one from each of his mouths. Brahma is consort of Saraswati and he is the father of Four Kumaras, Narada, Daksha, Marichi and many more. Several Puranas describe him as emerging from a lotus, connected to the navel of Lord Vishnu. Other Puranas suggest that he is born from Shiva or his aspects, or he is a supreme god in diverse versions of Hindu mythology. Brahma, along with other deities, is sometimes viewed as a form (saguna) of the otherwise formless (nirguna) Brahman, the ultimate metaphysical reality in Vedantic Hinduism. In an alternate version, some Puranas state him to be the father of Prajapatis. According to some, Brahma does not enjoy popular worship in present-age Hinduism and has lesser importance than the other members of the Trimurti, Vishnu and Shiva. Brahma is revered in ancient texts, yet rarely worshiped as a primary deity in India. Very few temples dedicated to him exist in India; the most famous being the Brahma Temple, Pushkar in Rajasthan. Brahma temples are found outside India, such as at the Erawan Shrine in Bangkok. Left: Brahma at the 12th century Chennakesava Temple, Somanathapura; Right: Brahma at a 6th/7th Aihole temple. The origins of Brahma are uncertain, in part because several related words such as one for Ultimate Reality (Brahman), and priest (Brahmin) are found in the Vedic literature. The existence of a distinct deity named Brahma is evidenced in late Vedic text. A distinction between spiritual concept of Brahman, and deity Brahma, is that the former is a genderless abstract metaphysical concept in Hinduism, while the latter is one of the many masculine gods in Hindu tradition. The spiritual concept of Brahman is far older, and some scholars suggest deity Brahma may have emerged as a personal conception and visible icon of the impersonal universal principle called Brahman. Contrasted to the neuter noun is the masculine noun brahmán, whose nominative singular form is Brahma. [note 2] This singular form is used as the proper name of the deity, Brahma. One of the earliest mentions of Brahma with Vishnu and Shiva is in the fifth Prapathaka (lesson) of the Maitrayaniya Upanishad, probably composed in late 1st millennium BCE. Brahma is first discussed in verse 5,1, also called the Kutsayana Hymn, and then expounded in verse 5,2. In the pantheistic Kutsayana Hymn, the Upanishad asserts that one's Soul is Brahman, and this Ultimate Reality, Cosmic Universal or God is within each living being. It equates the Atman (Soul, Self) within to be Brahma and various alternate manifestations of Brahman, as follows, "Thou art Brahma, thou art Vishnu, thou art Rudra (Shiva), thou art Agni, Varuna, Vayu, Indra, thou art All." Now then, that part of him which belongs to Tamas, that, O students of sacred knowledge (Brahmacharins), is this Rudra. That part of him which belongs to Rajas, that O students of sacred knowledge, is this Brahma. That part of him which belongs to Sattva, that O students of sacred knowledge, is this Vishnu. Verily, that One became threefold, became eightfold, elevenfold, twelvefold, into infinite fold. This Being (neuter) entered all beings, he became the overlord of all beings. That is the Atman (Soul, Self) within and without – yea, within and without! While the Maitri Upanishad maps Brahma with one of the elements of Guṇa theory of Hinduism, the text does not depict him as one of the trifunctional elements of the Hindu Trimurti idea found in later Puranic literature. In Vaishnava Puranic scriptures, Brahma emerges on a lotus from Vishnu's navel as Vishnu (Mahavishnu) creates the cosmic cycle, after being emerge by Shiva, Shiva told Vishnu to create, Shiva order Vishnu to make Brahma. The post-Vedic texts of Hinduism offer multiple theories of cosmogony, many involving Brahma. These include Sarga (primary creation of universe) and Visarga (secondary creation), ideas related to the Indian thought that there are two levels of reality, one primary that is unchanging (metaphysical) and other secondary that is always changing (empirical), and that all observed reality of the latter is in an endless repeating cycle of existence, that cosmos and life we experience is continually created, evolved, dissolved and then re-created. The primary creator is extensively discussed in Vedic cosmogonies with Brahman or Purusha or Devi among the terms used for the primary creator, while the Vedic and post-Vedic texts name different gods and goddesses as secondary creators (often Brahma in post-Vedic texts), and in some cases a different god or goddess is the secondary creator at the start of each cosmic cycle (kalpa, aeon). Brahma is a "secondary creator" as described in the Mahabharata and Puranas, and among the most studied and described. Born from a lotus emerging from the navel of Vishnu after emerging on order of Shiva, Brahma creates all the forms in the universe, but not the primordial universe itself. In contrast, the Shiva-focussed Puranas describe Brahma and Vishnu to have been created by Ardhanarishvara, that is half Shiva and half Parvati; or alternatively, Brahma was born from Rudra, or Vishnu, Shiva and Brahma creating each other cyclically in different aeons (kalpa). Thus in most Puranic texts, Brahma's creative activity depends on the presence and power of a higher god. In the Bhagavata Purana, Brahma is portrayed several times as the one who rises from the "Ocean of Causes". Brahma, states this Purana, emerges at the moment when time and universe is born, inside a lotus rooted in the navel of Hari (deity Vishnu, whose praise is the primary focus in the Purana). The scriptures asserts that Brahma is drowsy, errs and is temporarily incompetent as he puts together the universe. He then becomes aware of his confusion and drowsiness, meditates as an ascetic, then realizes Hari in his heart, sees the beginning and end of universe, and then his creative powers are revived. Brahma, states Bhagavata Purana, thereafter combines Prakriti (nature, matter) and Purusha (spirit, soul) to create a dazzling variety of living creatures, and tempest of causal nexus. The Bhagavata Purana thus attributes the creation of Maya to Brahma, wherein he creates for the sake of creation, imbuing everything with both the good and the evil, the material and the spiritual, a beginning and an end. The Puranas describe Brahma as the deity creating time. They correlate human time to Brahma's time, such as a mahākalpa being a large cosmic period, correlating to one day and one night in Brahma's existence. The stories about Brahma in various Puranas are diverse and inconsistent. In Skanda Purana, for example, goddess Parvati is called the "mother of the universe", and she is credited with creating Brahma, gods and the three worlds. She is the one, states Skanda Purana, who combined the three Gunas - Sattva, Rajas and Tamas - into matter (Prakrti) to create the empirically observed world. The Vedic discussion of Brahma as a Rajas-quality god expands in the Puranic and Tantric literature. However, these texts state that his wife Saraswati has Sattva (quality of balance, harmony, goodness, purity, holistic, constructive, creative, positive, peaceful, virtuous), thus complementing Brahma's Rajas (quality of passion, activity, neither good nor bad and sometimes either, action qua action, individualizing, driven, dynamic). Left: 19th century roundel of four-headed Brahma as a red-complexioned aged man, holding manuscript (Vedas), a ladle and a lotus; Right: 6th century Brahma in Badami cave temples holding a writing equipment, ladle, and mala. Brahma is traditionally depicted with four faces and four arms. Each face of his points to a cardinal direction. His hands hold no weapons, rather symbols of knowledge and creation. In one hand he holds the sacred texts of Vedas, in second he holds mala (rosary beads) symbolizing time, in third he holds a sruva or shruk — ladle types symbolizing means to feed sacrificial fire, and in fourth a kamandalu – utensil with water symbolizing the means where all creation emanates from. His four mouths are credited with creating the four Vedas. He is often depicted with a white beard, implying his sage-like experience. He sits on lotus, dressed in white (or red, pink), with his vehicle (vahana) – hansa, a swan or goose – nearby. Chapter 51 of Manasara-Silpasastra, an ancient design manual in Sanskrit for making Murti and temples, states that a Brahma statue should be golden in color. The text recommends that the statue have four faces and four arms, have jata-mukuta-mandita (matted hair of an ascetic), and wear a diadem (crown). Two of his hands should be in refuge granting and gift giving mudra, while he should be shown with kundika (water pot), akshamala (rosary), and a small and a large sruk-sruva (laddles used in yajna ceremonies). The text details the different proportions of the murti, describes the ornaments, and suggests that the idol wear chira (bark strip) as lower garment, and either be alone or be accompanied with goddesses Sarasvati on his right and Gayatri on his left. Brahma's wife is the goddess Saraswati. She is considered to be "the embodiment of his power, the instrument of creation and the energy that drives his actions". In some texts Gayatri is considered as second wife of Lord Brahma. In Dasam Granth, mentioned seven Brahma Avatars called Saptavatars. Brahma temples are relatively rare in India. Above: Brahma temple in Pushkar, Rajasthan. Very few temples in India are primarily dedicated to Lord Brahma and his worship. The most prominent Hindu temple for Brahma is the Brahma Temple, Pushkar. Other temples include a temple in Asotra village, Balotra taluka of Rajasthan's Barmer district known as Kheteshwar Brahmadham Tirtha. Brahma is also worshipped in temple complexes dedicated to the Trimurti: Uthamar Kovil, Ponmeri Shiva Temple, in Tirunavaya, the Thripaya Trimurti Temple and Mithrananthapuram Trimurti Temple. In Tamil Nadu, Brahma temples exist in the temple town of Kumbakonam, in Kodumudi and within the Brahmapureeswarar Temple in Tiruchirappalli. There is a temple dedicated to Brahma in the temple town of Srikalahasti near Tirupati, Andhra Pradesh. There are a Chaturmukha Brahma temple in Chebrolu, Andhra Pradesh, and a seven feet height of Chatrumukha (Four Faces) Brahma temple at Bangalore, Karnataka. In the coastal state of Goa, a shrine belonging to the fifth century, in the small and remote village of Carambolim, Sattari Taluka in the northeast region of the state is found. A famous icon of Brahma exists at Mangalwedha, 52 km from the Solapur district of Maharashtra and in Sopara near Mumbai. There is a 12th-century temple dedicated to him in Khedbrahma, Gujarat and also a Brahma Kuti Temple in Kanpur. Temples exist in Khokhan, Annamputhur and Hosur. A shrine to Brahma can be found in Cambodia's Angkor Wat. One of the three largest temples in the 9th-century Prambanan temples complex in Yogyakarta, central Java (Indonesia) is dedicated to Brahma, the other two to Shiva (largest of three) and Vishnu respectively. The temple dedicated to Brahma is on southern side of Śiva temple. A statue of Brahma is present at the Erawan Shrine in Bangkok, Thailand and continues to be revered in modern times. The golden dome of the Government House of Thailand houses a statue of Phra Phrom (Thai representation of Brahma). An early 18th-century painting at Wat Yai Suwannaram in Phetchaburi city of Thailand depicts Brahma. The name of the country Burma may be derived from Brahma. In medieval texts, it is referred to as Brahma-desa. Brahma is a popular deity in Chinese folk religion and there are numerous temples devoted to the god in China and Taiwan. Brahma is known in Chinese as Simianshen (四面神, "Four-Faced God") or Fantian (梵天), Tshangs pa in Tibetan and Bonten in Japanese. Brahma (Sanskrit: ब्रह्मा, brahmā) is distinct from Brahman. Brahma is a male deity, in the post-Vedic Puranic literature, who creates but neither preserves nor destroys anything. He is envisioned in some Hindu texts to have emerged from the metaphysical Brahman along with Vishnu (preserver), Shiva (destroyer), all other gods, goddesses, matter and other beings. In theistic schools of Hinduism where deity Brahma is described as part of its cosmology, he is a mortal like all gods and goddesses, and dissolves into the abstract immortal Brahman when the universe ends, then a new cosmic cycle (kalpa) restarts. The deity Brahma is mentioned in the Vedas and the Upanishads but is uncommon, while the abstract Brahman concept is predominant in these texts, particularly the Upanishads. In the Puranic and the Epics literature, deity Brahma appears more often, but inconsistently. Some texts suggest that god Vishnu created Brahma, others suggest god Shiva created Brahma, yet others suggest goddess Devi created Brahma, and these texts then go on to state that Brahma is a secondary creator of the world working respectively on their behalf. Further, the medieval era texts of these major theistic traditions of Hinduism assert that the saguna (representation with face and attributes) Brahma is Vishnu, Shiva, or Devi respectively, and that the Atman (soul, self) within every living being is the same or part of this ultimate, eternal Brahman. Brahman (Sanskrit: ब्रह्मन्, brahman) is a metaphysical concept of Hinduism referring to the ultimate reality. According to Doniger, the Brahman in the Hindu thought is the uncreated, eternal, infinite, transcendent, the cause, the foundation, the source and the goal of all existence. Brahmin (Sanskrit: ब्राह्मण, Brahmin) is a varna in Hinduism specializing in theory as priests, preservers and transmitters of sacred literature across generations. The Brahmanas, or Brahmana Granthas, (Sanskrit: ब्राह्मणग्रंथ, brāhmaṇa) are one of the four ancient layers of texts within the Vedas. They are primarily a digest incorporating stories, legends, the explanation of Vedic rituals and in some cases philosophy. They are embedded within each of the four Vedas, and form a part of the Hindu śruti literature. ^ In Devanagari brahma is written ब्रह्म. It differs from Brahma ब्रह्मा by having a matra (diacritical) in the form of an extra vertical stroke at the end. This indicates a longer vowel sound: long "ā" rather than short "a". ^ Charles Russell Coulter; Patricia Turner (2013). Encyclopedia of Ancient Deities. Routledge. p. 240. ISBN 978-1-135-96397-2. , Quote: "Brahma, a creator god, received the basics of his mythological history from Purusha. During the Brahmanic period, the Hindu Trimurti was represented by Brahma with his attribute of creation, Shiva with his attribute of destruction and Vishnu with his attribute of preservation." ^ Dalal, Roshen (18 April 2014). The Religions of India: A Concise Guide to Nine Major Faiths. Penguin UK. ISBN 9788184753967. ^ Gopal, Madan (1990). K.S. Gautam (ed.). India through the ages. Publication Division, Ministry of Information and Broadcasting, Government of India. p. 79. ^ Sutton, Nicholas (2000). Religious doctrines in the Mahābhārata (1st ed.). Delhi: Motilal Banarsidass Publishers. p. 182. ISBN 81-208-1700-1. ^ a b Frazier, Jessica (2011). The Continuum companion to Hindu studies. London: Continuum. p. 72. ISBN 978-0-8264-9966-0. ^ Roshen Dalal (2010). The Religions of India: A Concise Guide to Nine Major Faiths. Penguin Books. pp. 66–67. ISBN 978-0-14-341517-6. ^ Thomas E. Donaldson (2001). Iconography of the Buddhist Sculpture of Orissa. Abhinav. p. 99. ISBN 978-81-7017-406-6. ^ Robert E. Buswell Jr.; Donald S. Lopez Jr. (2013). The Princeton Dictionary of Buddhism. Princeton University Press. pp. 141–142. ISBN 978-1-4008-4805-8. ^ a b Wendy Denier (1999). Merriam-Webster's Encyclopedia of World Religions. Merriam-Webster. p. 140. ISBN 978-0-87779-044-0. ^ H. W. Bodewitz (1990). The Jyotiṣṭoma Ritual: Jaiminīya Brāhmaṇa. BRILL Academic. ISBN 90-04-09120-3. Wikimedia Commons has media related to Brahma.